The SIG Sauer P220 is a piece of masterful artwork. The first of the legendary P series of handguns from SIG Sauer introduced one of the most well made modern semi-automatic pistols in the world. The SIG P220 was designed in 1975 and has remained a mainstay of the SIG Sauer lineup. 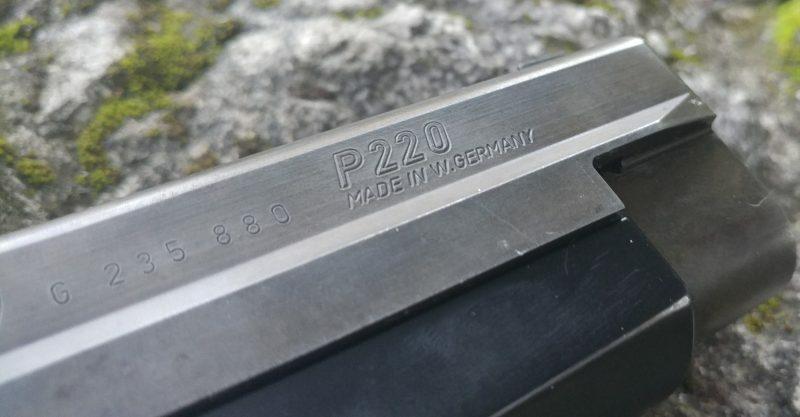 The P220 is a big boy, that fires a big caliber, and makes a big impression. The SIG Sauer P220 is a semi-automatic handgun chambered in 45 ACP with a DA/SA trigger system. The SIG Sauer P series of pistols has a decocker except for their single action pistols, and DAK or DA only designs. 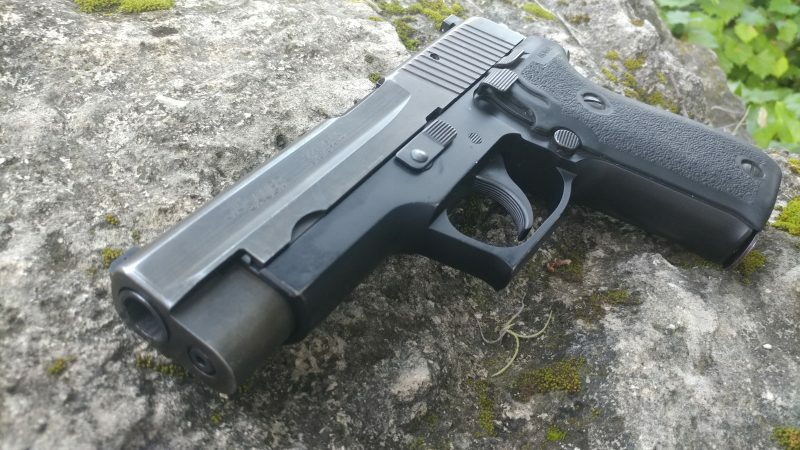 This is a very standard P220, and an old one. This is a West German marked model. Internet wisdom says the West German models are superior, but I don't have a modern version to compare it to. The P220 is a big heavy gun that holds a low eight rounds. The gun is a product of its time being two pounds, being 1.5 inches thick, and carrying only eight rounds. Back in the 1970s the idea of a high capacity firearm was only really gaining ground, and the 45 ACP still required a reliable and most importantly thin single stack magazine. It should also be noted most police forces were still knee deep in revolvers, at least in the United States. The SIG P220 offered two more rounds than most police revolvers. 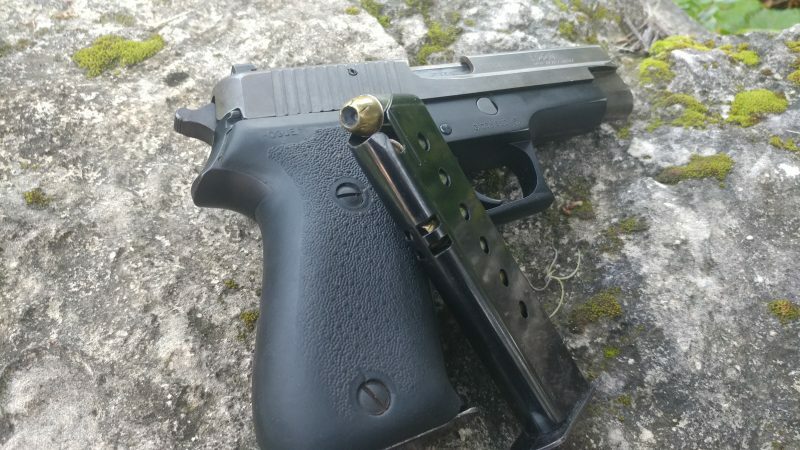 The P220 was initially built with a heel magazine release, but SIG Sauer was wise enough to jump to a standard push-button magazine release. The gun was initially imported into the United States as the Browning BDA but eventually became the proper SIG P220. 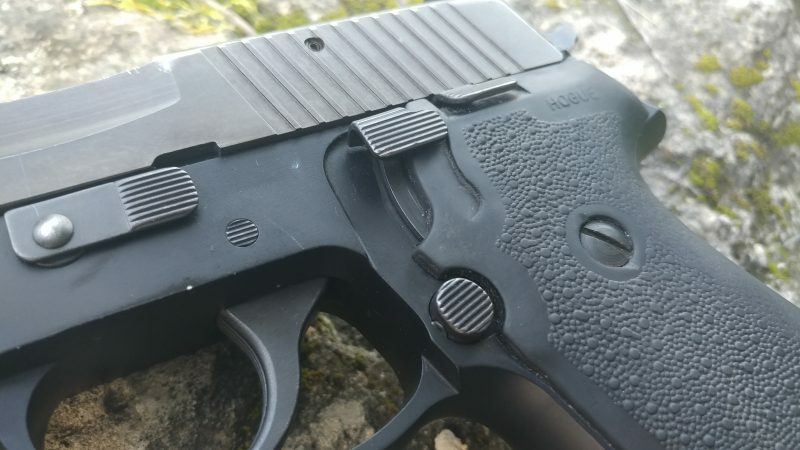 These days the P220 comes in a wide variety of different variants including a railed model, a smaller carry model, a compact, a Combat, and ST model. These all have slight differences, and of course, SIG introduced a Legion variant of the P220 to go with that line. The P220 is a still a legendary gun and has a huge fan base. This is a well worn SIG P220, but not in a bad way. It’s smooth as butter. The slide feels like it's on ball bearings and it glides rearward. The mag release, decocker, and more are smooth. Smoother than Prince in Purple Rain. This particular model is quite broken in if I do say so myself. Let’s talk trigger first. , and the internals may have been modded. I say this because the trigger is just fantastic. Either it's been modded, or the gun is at that perfect level of smooth wear. The double action is long but not very heavy, and it moves smoothly and grit free. The single action trigger should be on the cover of the Sports Illustrated swimsuit issue because it is hot. The trigger pull is smooth and ridiculously light. If you've ever heard the phrase, “The trigger should surprise you.” Well, this trigger will surprise you. It barely resists your finger as it travels rearward. The travel is short, as is the reset. 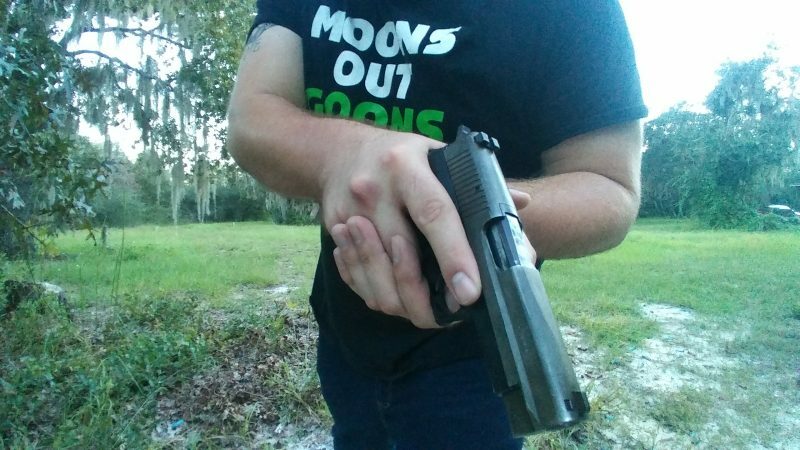 Once you pop off that first double action round, you transition seamlessly into the single action. The single action makes rapid double taps a breeze and its even more comfortable due to the weight of the weapon. The gun is 2 pounds of metal, and it eats up the 45 ACP’s recoil. The same could be said for that fat and round grip of the gun. It makes the recoil soft and enjoyable. 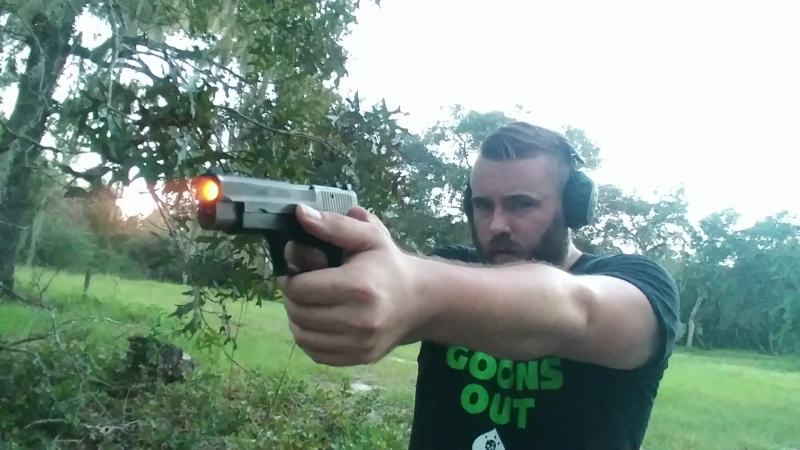 The 45 ACP isn't precisely a fierce hand cannon but its no rimfire plinker either. The muzzle rise isn't significant and staying on target isn't an issue. This is a full sized duty gun so there is an expectation that the gun will be easy to control. It fits the bill well. The only real downside is the magazine well feels super narrow. Maybe I’m double stack spoiled but the magazine well is super small, and it takes me a few fractions of a second longer to reload the SIG P220. Speaking of magazines, the simple single stack mags work well and feed reliably. My example came with three magazines that equally as worn as the SIG P220, yet they function brilliantly. The best way to describe this big bore beauty is brilliant. It’s a well made, easy shooting piece of Swiss and German engineering. The SIG P220 is an excellent gun, although as a full sized duty gun it feels a bit behind the curve. The low capacity is overshadowed by 45 ACPs like the SIG P227 and the FNX Tactical. Overall the SIG p220 has remained part of SIG’s P series for a reason. 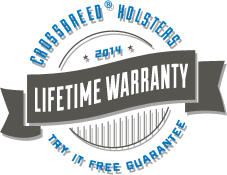 The gun works are well supported by the industry and its the grandparent of the SIG P series. There doesn’t seem to be any plans to put Granpa in the retiring home anytime soon.